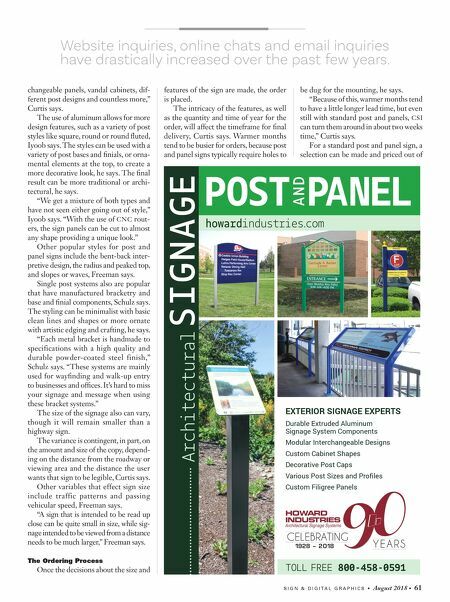 60 • August 2018 • S I G N & D I G I T A L G R A P H I C S ARCHITECTURAL AND ENVIRONMENTAL "Eye-level post and panel signs are a better choice rather than a towering sign overhead," Iyoob says. "A sign detached from the building puts it more out in the viewing area rather than having to look directly at buildings for identification." Material Preferences Post and panel signs are more afford- able than signs that need a masonry base for mounting, which can drive up the cost, Curtis says. The most common material is aluminum for its durabil- ity, particularly aluminum extrusions because of the weight-to-strength ratio and pliability that eases the customiza- tion process, he says. Aluminum and steel composite panels, used for panel inserts and dimensional accents, also are durable while bearing less of a cost, he says. "The most durable and lasting signs are made of powder-coated aluminum," Iyoob says. "Aluminum will not rust, and a powder-coated finish will last many years." Signs made out of aluminum, which is lightweight and non-corrosive and has sustainable alloy attributes, can be fin- ished with a variety of techniques, such as automotive-grade liquid paint, pow- der coating and anodizing, Freeman says. Advances in solvent inks in printed vinyl and direct-to-substrate UV-cure printing also increases the durability of the signs, he says. Other materials can be integrated into the signs to further enhance the look, such as a rust finish, Curtis says. " CSI offers this finish on any of their sign systems, and the finish is outdoor durable and looks great for achieving an old industrial feel," Curtis says. The signs can get the desired feel or aesthetic appeal in other ways, such as by employing custom shapes, Curtis says. The panels do not have to be limited to a rectangle or square and can incorporate other shapes into their designs, he says. In the past, post and panel signs tended to use bulkier parts, but today the designs tend to be sleeker and more streamlined, he says. "Extrusions also allow for customiza- tion of post and panels via radius accents, Component Signage developed this panel-and-post decorative sign for the Sherwood & Mitchell Law Offices, listing the names of all five offices. Howard Industries created a post-and-panel sign for Livingston Alexander House Residence Hall at the University of Pittsburgh Bradford in Bradford, Pennsylvania. The sign features an indented radius top and small ball post caps. 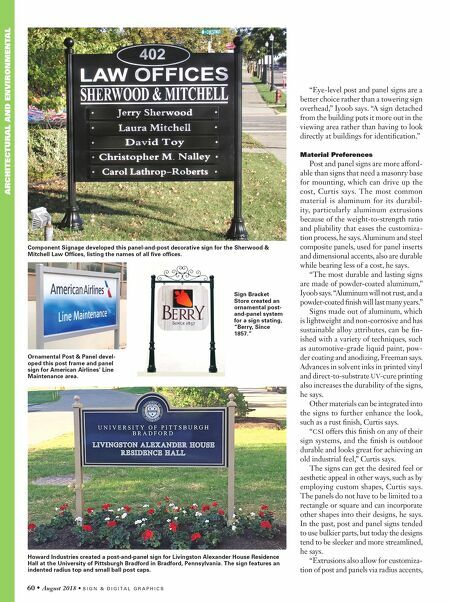 Sign Bracket Store created an ornamental post- and-panel system for a sign stating, "Berry, Since 1857." Ornamental Post & Panel devel- oped this post frame and panel sign for American Airlines' Line Maintenance area.